Ruby is a an extremely hard aluminum oxide (called corundum) with a hexagonal crystal system. It is the red variety of corundum as well as one of the primary varieties, along with Sapphire. Ruby’s color range includes red, reddish-pink, and blood orange red and can sometimes be found in blue and green varieties. Depending on the variety it can appear in pink, blue, and green. The bold and intense red color is caused by chromium, and occasionally inclusions of titanium oxide causes light diffusion within the Ruby in the shape of a six pointed star. Ruby was named after the Latin word meaning “red”. It is primarily found in Burma, India, Brazil, Thailand, Sri Lanka, and USA. This unique crystal has been known to exist since before the time of the Bible, but up until the early 1800’s, many Rubies consisted of what is now known as red Spinels and Garnets. Many ancient legends revolve around the use of Rubies throughout human history. In Burma, inserting a Ruby into one’s flesh would make them invulnerable and provide protection. During the Middle Ages in Europe, Rubies were used to convey good health and remove negative energies from the user. 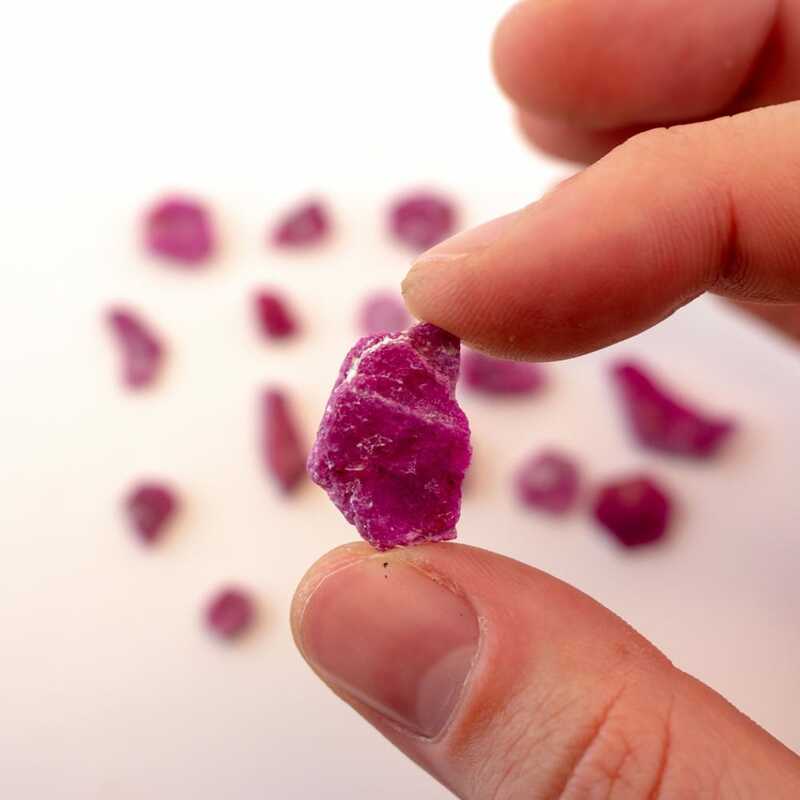 Chinese lore has also said that Emperor Kublai Khan offered an entire city in exchange for a very large Ruby. Throughout time, Ruby has been known as a stone of nobility. The vibrations of Ruby resonate with ultimate life force and emanate the highest vibrations of pure red light. Ruby is a powerful grounding stone that greatly increases the chi in one’s body, flourishing all bodily systems and organs for the utmost performance. It stimulates harmonious chi flow throughout the body and draws life force directly into the root. This highly energizes the physical, emotional, and mental bodies making Ruby an especially powerful tool for those who feel a daily lack of strength. Rubies excel at gathering and amplifying energy while promoting and stimulating mental concentration so that one may focus mass amounts of energy towards any goal. Ruby brings out the fortitude within, giving one the courage and strength to forge ahead despite adversities. It sparks one's zest for life and encourages one to follow their passions. In situations of failure or pain, the vibrations of this stone will eliminate feelings of despair and defeat, preventing negativity from consuming the mind. Ruby will help anyone who experiences anxiety from lack of confidence in oneself as well as those who constantly fear the future and change. This special stone takes away that fear of death that stops us from doing so many things in our lives. Ruby is a very courageous stone and will eventually push you to face old fears that can easily be conquered with the strength that the Ruby will provide. Even once a fear is conquered, Ruby will continue to inspire you to face any obstacle that may bring about a negative mindset and a body riddled with anxiety. Ruby harmonizes very well with Blue Sapphire due to the self-control and determination properties that combine with the Ruby’s strength and courage. Using Rose Quartz in conjunction with Ruby will offer a fiery passion that can help heal and mend broken or old relationships of any caliber. Ruby has a very powerful effect on dreams and anyone who is trying to bring lucidity into their dream state. The energy from the Ruby is very intense and vivid, but will add understanding to the imagery depictions in your dreams. Utilizing and fully understanding the ruby will bring forth near complete control on your dreams nightly.